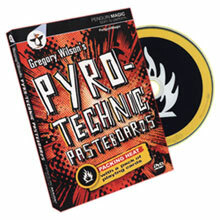 Pyrotechnic Pasteboards picks up where Gregory’s best-selling Card Stunts video left off. Forget those mind-numbing, deal down, Uncle Charlie card tricks. This is fast and furious, in-your-face card flaunting! Think Jackie Chan with 52 potential papercuts! • Point Blank - Greg’s reputation-making version of the Ambitious Card done with a completely blank deck. It’s a portable 5-minute piece of theater that ends up with the spectator’s signed card fused to your signed card! • Flashback - This freaky 8-phase routine is done in reverse. That’s why you should take your standing ovation first-just to get it out of the way. • Straight A’s - When they see this four ace revelation, you can forget about that friendly little poker game after the show. • Lethal Fours - Gentlemen, start your Elmsley’s. This is Wilson’s take on Williamson’s take on Victor’s 11 Card Trick. • Cards to Pocket - Greg’s razzle-dazzle version of this time-honored classic. • FISM Aces - The aces shoot out of a shuffled pack like angry hornets and then boomerang back to you like...well, boomerangs. Oh, by the way, did we mention that the entire pack vanishes as well?